Never-Slip safety treads. Easy to put on and take off with rubber heel tab. No buckles or ties to fasten. Small steel spikes penetrate ice and snow. Lightweight, comfortable, and compact. Will fit over any style shoe. Will not interfere with driving. 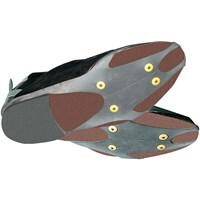 Men and Women- Order next shoe size to fit large-size work shoes, boots and insulted footwear.